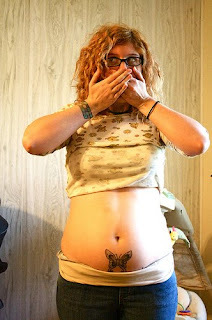 Ladies, please hear this… avoid tummy tattoos before your child bearing years! P.S. That tattoo of the little man mowing your... ehem... hair is funny, but you may find it a bit embarrassing when you go to have your baby! Thanks for the laugh. I had a patient one time that had some kind of anchor on her hip. Several coworkers thought it looked like something obscene with a fully pregnant belly stretching the tattoo. So true! Those are usually the patients that are scared of needles too! So funny! I actually tried to talk a girl I knew in college out of this, but she wouldn't listen...oh well, she'll wished she listened one day! OMG, these are the same things I thought about before I got my first tattoo last summer. Which, is on my left shoulder blade! 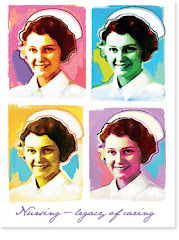 I am also a nurse and I have always thought the same thing. Especially on the 80 year old woman who has the tattoo on her breasts. Sagging isn't cool when it's a butterfly or a heart! So funny!!! 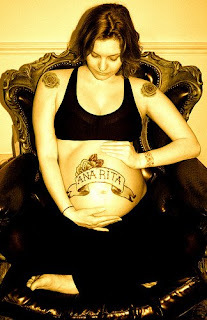 I had never considered how a tatoo would look like over a pregnant belly! But then again I'd never get a tatoo because it sounds too painful for this wimp!! I bet you have seen a lot of "interesting" things as an L&D nurse!! LOL so very true! Unless you have a big 4X4 truck going across your belly the stretch marks can be mud tracks! Oh now these are funny/a little disturbing. Wasn't there a Saturday Night Live skit about this very thing? It was hysterical! Thanks for the laugh. Oh my goodness...that is hilarious. I bet you do see lots of crazy things. I just remember thinking..."I hope my legs are shaved or I'll be so embarrassed." Thanks for stopping by to visit Life of a Southern Belle. 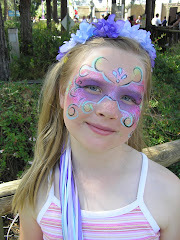 I'm thrilled to discover your blog and will be back often! That's hysterical. I'm a part time nurse too! I work in the surgical ICU, and as a nursing supervisor PRN. I love your stories. Hysterical! See we're more alike than you thought. I so wish you could post some of the goodies you get to see! Hee Hee, that made me laugh, Don't have a tattoo, and I'm glad I don't. An extra 40 pounds can add a lot of stretch!! 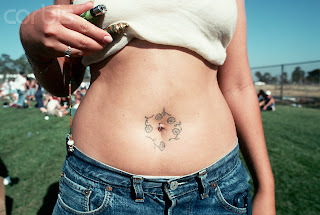 i can't imagine what a tatoo on my belly would look like at this point. but those were great!